We went to Entebbe today to visit the Ngamba Island Chimpanzee Sanctuary, where 42 orphaned chimpanzees live in a natural habitat. The boat rides are timed to arrive with the feeding times. Because of the rain and big waves, it was a rough ride on Lake Victoria as we crossed the equator and felt like a 40-minute roller coaster ride. But it was well worth the trip and incredible to see so many chimps up close as they made a huge racket chasing each other around. 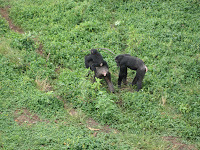 Our guide explained that the chimps have similar politics to humans. There is an alpha male who leads the group and may behave like a dictator not letting any of the other males get near the females. The younger males will work together to overthrow the alpha male but once in power the alpha male will behave similar to the previous leader and disown his helpers. Very interesting place to see chimps who are just like humans. Will DNA for males and chimps improve with time?